What exactly is a marijuana plant? Seems a fairly straightforward question with a simple answer. However, the issue has been muddled in Michigan, where the Court of Appeals had to take on the issue in Michigan v. Ventura. The issue was raised after police in Grand Rapids raided the home of the defendant in this case, who was a medical marijuana card holder. Once inside, authorities discovered 21 marijuana plants – plus an additional 22 “clones” of those plants. Either way, he was over the limit of 19 that he was allowed to grow under the state’s 2008 medical marijuana law. Still, the language of the law was a bit hazy to begin with. Beyond that, the difference between being three plants over and 25 plants over is significant in terms of charges and penalties. 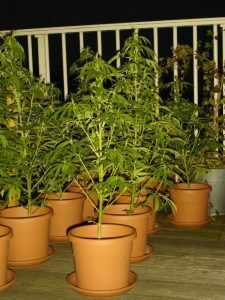 Defendant argued the 22 clones – which were portions of the plant that had been transplanted to different pots – were simply leaves and cuttings. However, after referencing the dictionary, a federal case and decision handed down recently by the Idaho Court of Appeals, the three-judge panel all agreed the clones were in fact plants. That means defendant violated the law by owning 43 plants, meaning he’ll get no reprieve on the penalty that requires him to serve two years on probation and 120 hours on community service. Part of the basis for this ruling was the fact that the clones reportedly had leaves and roots structures. They were all green and leafy and, the justices noted, “alive.” That meant they were plants. There was no dispute that the plants weren’t large and they weren’t mature either. But the statute never stipulated between large and small plants and mature versus non-mature plants. Last year, the Michigan Supreme Court established a four-part test intended to help lower court judges ascertain whether the state’s medical marijuana statute shields a defendant from prosecution. This came after seven years of case after case involving defendants trying to assert protection under the statute. But even the four-part test hasn’t eliminated these cases. Just this year, the Michigan Court of Appeals has heard arguments in 22 different medical marijuana cases – including this so-called “clone” case. When the Michigan Supreme Court issued its four-part test, justices wrote that there were so many inconsistencies in the law, it created substantial confusion for law enforcement, attorneys, judges, patients and caregivers. Interpreting and applying it has consumed “valuable public and private resources” justices noted. Tagged: California marijuana lawyer, marijuana attorney and marijuana lawyer L.A.